Your bathroom is a place of peace and solitude, then one day, as you ready yourself for a relaxing bath, you notice a small crack in the center of your bathtub. While it may not be a cause of alarm, that small crack can lead to further problems if unaddressed. 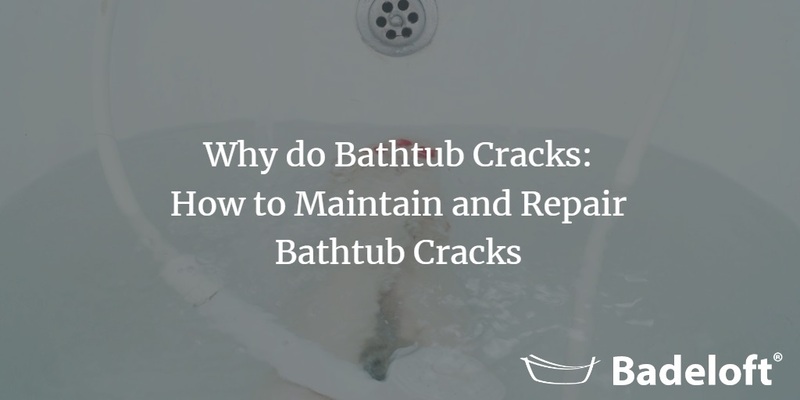 There are three main reasons why cracks tend to form in, bathtub materials which is lack of support or if the material is flexible, damage from heavy objects and damage from heavy cleaners. Some material such as fiberglass is highly flexible, meaning it will bend if weight it placed on it. If this sort of material is installed improperly or without additional support, overtime the weight pressure will cause cracks to form. Cracks also tend to form when objects are dropped on the bathtub, creating small divots and dents that will eventually spiral out into much larger cracks and crevices over time. Lastly, with highly abrasive cleaners such as bleach, the finish and gloss of the bathtub can easily be eroded away, allowing more moisture into the material, causing cracks. So why are cracks dangerous? Well, if ignored, even tiny cracks in your bathtub can eventually become much larger cracks down the road. Cracks usually mean that more water and moisture will tract into the inside of your bathtub, causing the integrity to weaken more and more overtime, until eventually the entire bathtub cracks in half. Generally, cracking is commonplace in fiberglass bathtubs. Though the material is inexpensive, it is highly porous, meaning it will absorb water and it cannot withstand heavy punishment, meaning that fiberglass matches all three criteria for cracks to form. So how do we fix this problem? Well, though it may be costly in the beginning, investing in higher quality materials early will save you trouble down the road. Stone resin, for example, is very stable and will not bend to any weight placed on it. Summarily, stone resin can also withstand heavy impacts from objects without chipping or cracks and finally, stone resin bathtubs are 100% non-porous, meaning they will not absorb water nor are abrasive cleaners necessary in their maintenance. Stress crack:-Stress cracks form when a heavy object is accidentally dropped in your bathtub. Generally, these types of cracks are surface level and are easy to repair-simply go to your nearest home improvement store and buy an inexpensive repair kit and you can easily patch these types of cracks yourself. How to maintain a bathtub? To prevent cracking and maintain longevity in your bathtub, first install your bathtub with proper support so your additional weight will not flex or strain your material. Second, avoid cleaning with abrasive cleaners such as bleach and of course, avoid dropping any heavy material in your bathtub. How much does fixing a bathtub cost? Though it will vary from professional to professional, generally contractors and plumbers will cost anywhere from 80 dollars to 150 dollars an hour depending on their specialties. As you can imagine, this is quite costly for fixing your bathtub. However, with just a small amount of research and fairly cheap repair kits, many of these cracks can be done yourself for less than 50 dollars. On average, professional help costs anywhere from 80/hr to 110/hr. The benefits of professional help are two-fold-in addition to assisting with your current problem, they are also a great resource for consultation on future projects along with further advice on proper upkeep. They also come with the added benefit of additional knowledge that will help with installation that might be a bit more complicated for yourself. Now, here is the tricky part; hiring a trustworthy professional is a bit more complicated than consulting the yellow pages. Though there are plenty of plumbers listed online, be sure to have established quotes from them as well as good reviews along with a plumber license. In short, these professionals should be able to inform you just how much you are paying them for the job at hand along with an accurate time table. On the market, there are two common repair kits-surface repair kits and internal repair kits. Surface repair kits usually come in the form of a polymer based tape or paint that will seal the crack on the outer surface of your bathtub. Internal repair kits usually are glue or paste that will fill in the cracks from the inside. Both of these are fairly self-explanatory and inexpensive, usually running on average 30-40 dollars each, providing a cheap and easy alternative to hiring professional help. 1. Halt the Crack-At the end of each crack, drill a ¼ inch hole, this is known as a ‘stop-drill’ hole. 2. Fill the Crack- Using a 2-part polyester filler, mix according to instructions and apply the filler to the crack with a clean rubber spreader until the stop-drill holes and the cracks are completely filled-allow the filler to dry before proceeding. 3. Sand the Filler-Once the filler has dried, sand it down with light sandpaper. Rub lightly until the surface matches with the rest of your bathtub. Once finished, wipe the surface with denatured alcohol to prepare it for spraying. 4. Spray the Finish-Using your bathtub repair paint, spray a light coat and allow it to dry before adding more coats as necessary. 5. Buff the Tub- To finish your tub, you will need an auto polish urethane compound. Apply to give it a harder finish and feather the edges of the paint. Your bathtub is an essential part of your bath space, so please, make sure to properly maintain it and be sure to fix cracks and other blemishes as you see them, otherwise you may have a bigger problem looming over you down the road.